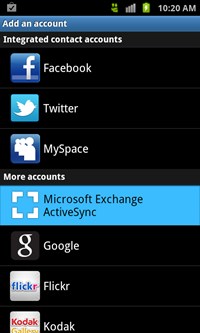 From the Home screen, touch Applications > Settings > Accounts and sync > Add account. 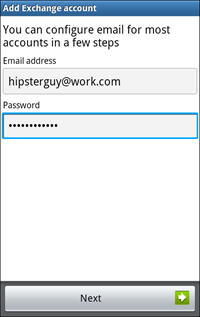 Enter your email address in the first box, then touch the Password box and enter your password. Touch Next. 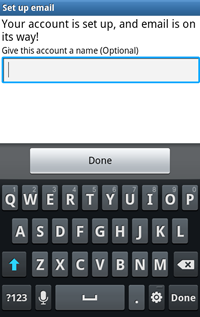 Review the message screen that is displayed. You can uncheck the Always show option, and then touch OK or Yes, to continue with the account set up. 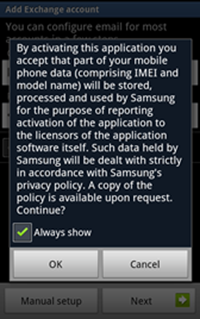 Your device will attempt to automatically find the additional details needed to set up your account. If it is successful, you will skip to Step 9. If it cannot automatically find the additional details needed, you will see the following screen. Enter your Domain. 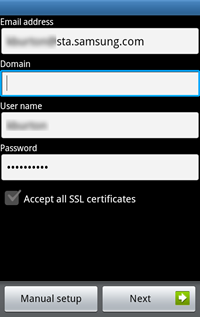 Some Exchange servers do not use a domain name; if yours does not, leave the domain information blank. Touch the Manual Setup box and edit the Exchange server name if necessary. Touch the Back key to see the additional options available. Mark any additional options that your Exchange server may require and touch Next. Peak schedule: Choose how often your device should connect to the Exchange server to get email during peak business hours. Choose Push to have email delivered to your device as soon as it arrives on the server. Off-peak schedule: Choose how often your device should connect to the Exchange server to get email during off-peak business hours. Choose Push to have email delivered to your device as soon as it arrives on the server. Amount to synchronize: Choose the time period that your device should keep in sync. Emails retrieval size: Set an email size limit. Your device will only download the headers for emails that exceed this limit. When you open the message you will be able to download the entire message. Period to sync Calendar: Choose the time period that your device should keep in sync. Notify me when email arrives: Mark this option to have your device notify you that you have new email messages. Sync contacts: Mark this option to synchronize your contacts to your device. 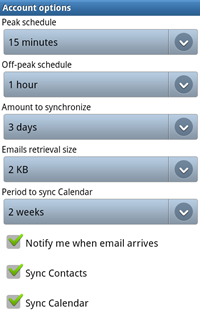 Sync calendar: Mark this option to synchronize your calendar to your device. Enter a name for the account. 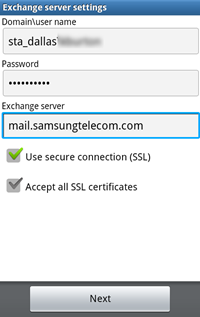 This will help you easily identify this account if you add additional email accounts to your device. Then touch Done. You will be taken back to the Add account screen. If you have additional accounts, you add them now; if not, touch the Back key to return to the Accounts and sync screen.